Your heart is going 100 beats per minute. No, you have not just finished running the marathon. You’re late for a meeting. You’re about to step in front of a crowd to speak. You’re experiencing stress. Your body is like an automobile, brimming with activity. Signals are being sent throughout your body. When a threat or fear is perceived, the brain, like the gas pedal of the car sends out “go” signals. It communicates with the engine called the autonomic nervous system. This system controls functions that are involuntary in the body such as heart rate, digestion, swallowing and perspiration, in much the same way as a car’s engine will rev faster automatically when more gas is applied. The brain sends out signals to various glands in your body. Messages are sent to the pituitary gland and stress hormones such as cortisol are released. Messages are also sent to the adrenal glands which begin pumping adrenaline into the bloodstream. Stress hormones bring about other changes in the body. Blood rushes away from the skin to the muscles and vital organs such as the heart which now beats faster. The skin is cool and sweaty. The throat is dry and it’s harder to swallow. Blood pressure and pulse rate increase. Airways in the lungs open up and allow more oxygen into the body. This prepares the brain, the lungs and the muscles. It also helps to increase alertness. All this happens automatically to prepare the body to deal with the perceived threat. The car driver has pushed the pedal and the body is responding. This is commonly known as the “fight or flight response”. If you have a history of neglect, emotional, physical, sexual, mental trauma with an accumulated flight or flight response you will be more stressed and anxious. Problems happen when the stress continues and isn’t resolved. Anxiety and trauma take their toll. Well, then the body begins to show unhealthy signs. Like a car that has been running hot and hard for too long, the engine really begins to suffer. If it’s not allowed to rest and cool off, it will show definite signs of wear and tear. Having come from a dysfunctional family, or had other traumas built up can contribute to more mental, emotional, physical, social, sexual problems later in life. Higher cortisol levels mean a bigger appetite. You’ll want to eat more to increase your energy and soothe your emotions. More food intake means increased weight/obesity/health problems. The driver of the body needs to apply the brakes. 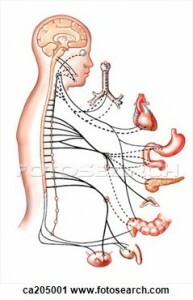 This brake in the body is called the “parasympathetic nervous system”. It calms and relaxes the body, helps to decrease the amount of stress hormones rushing and returns the body to its normal resting state. So how do you apply the brakes when you’re carrying a stress load? How do you begin to really deal with the stress response to trauma? If you are isolating yourself and not spending enough time with good friends or family members get out there and make a point of doing it. If you are not being physically active, make a point of enjoying some exercise like walking or swimming. Physical activity has been known to reduce stress. Take up yoga or tai chi; the fluid kind of movement and deep breathing will promote relaxation. Take up meditation as research shows that meditation shows help alleviate stress. Sustained stress from depression or anxiety or trauma can lead to other unhealthy conditions. Your body can go full speed but it needs pit stops. Your body has the ability to deal with stress and coordinate effective reactions towards resolution, but it needs direction and prompting. You are in the driver’s seat and with care and regular maintenance, your body will be good for many miles down the road.